In a recent short story, I wrote that two young men went off to work in a sawmill. There was a glitch in my logic. The events occurred in the 1830’s during the month of January. Sawmills ran on water power at this time, so their peak operating season came in the late winter and early spring. The mill wheel continued to run as long as the water flowed in rivers and lakes. What happened in the winter season when the waters froze over and the current couldn’t power the saws? Did the mill owners and workers pursue some alternate purpose over the span of time when the water didn’t flow? I learned that some set their sites on — ice harvesting! There was a four week window during which the ice was harvested in January. An “ice field” was selected in an area of slow moving water. In the case of a lake, shallow sandy bottomed areas were optimal because they produced the most optimal type of ice for refrigeration — clear, solid and free of air pockets. Entire village communities came together to harvest ice that would be taken home and stored in their own ice houses also known as spring houses. The ice was packed in salt, wrapped in cloth or old blankets, and buried in a hole in the bottom of the spring house. The ice was then covered with a layer of straw or sawdust for further insulation. The ice collected in the winter would last through to the next season. 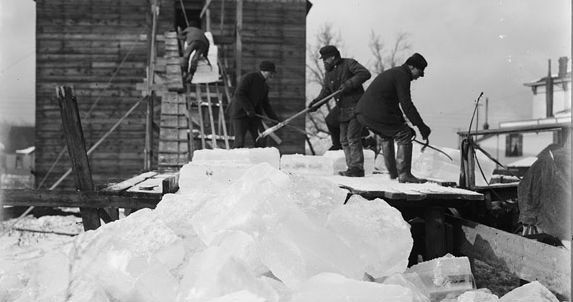 By the mid to late 1800s, some communities had businesses that harvested, stored and distributed large quantities of ice throughout the year. Blocks of ice could be purchased by weight, in 25-100 pound chunks. The deliveryman weighed portions at the ice wagon using a spring scale. The block was carried into the house using tongs, then it was chiseled to size and slid into ice boxes made of wood. There was a separate compartment in the top for the ice. The warmer air rose from the lower cabinet and forced a circulation of air inside the ice box. Melted water drained into a bucket through a hose. 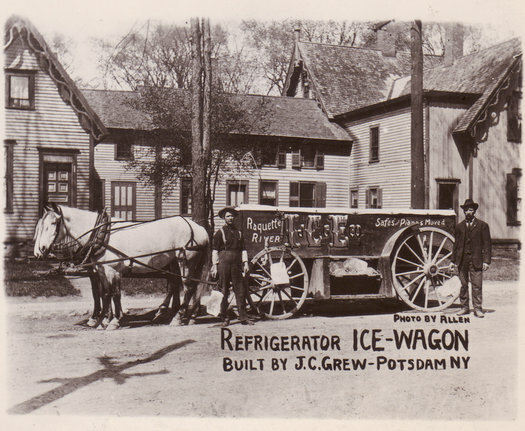 Dairy farmers also purchased ice for their milk houses to keep milk cool until it could be shipped. The process for harvesting ice was an interesting one. Holes were drilled in the ice during the freezing process so that water could rise through the openings and spread across the frozen surface. In this way, the ice was encouraged to thicken, layer by layer. An auger was used to track progress toward the desired thickness of between 14 and 16 inches. 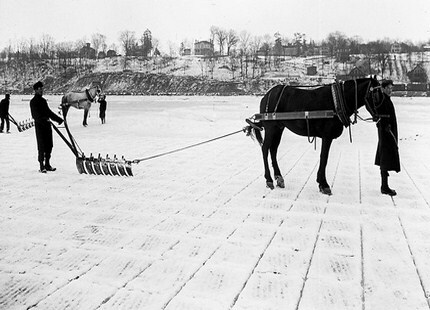 Before the ice was harvested, it was cleared of snow by a horse drawn wooden scraper. The surface was then scored by a horse drawn etcher so the block dimensions were uniform. Horses were fitted with special shoes to prevent their slipping on the ice. Boys referred to as “shiners” were in charge of cleaning up after the horses and disinfecting the ice with formaldehyde. In the late 1700s, axes were used to break up the ice but the process became more sophisticated as time passed. Manual ice saws were then used to cut the blocks of ice. Uniform blocks were much easier to stack and store than irregularly shaped ice. A breaker bar may be used to hit the ice and snap the blocks apart. 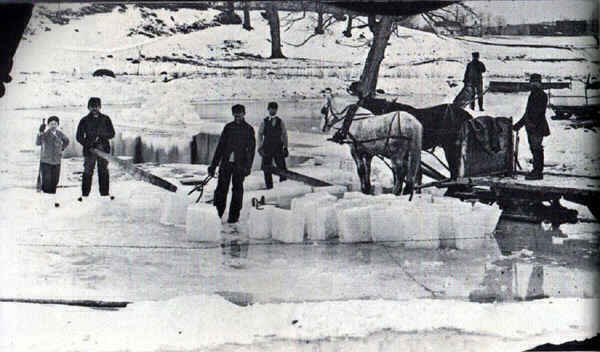 The ice blocks were then slid up a ramp by workers using ice picks and stacked in a wagon. The ice was then transported to an icehouse where it was stored in an 11 inch perimeter of saw dust. The period I am most interested in is the mid 1800s, but the following amateur video from 1919 is useful in showing the process of ice harvesting. You’ll see a horse powered pulley system for lifting the ice blocks into the ice house. Also, the men demonstrate great care and respect for the working animals. When the workers pause for lunch, each horse is fitted with a feedbag of oats and a blanket. Thank you for posting about the process of ice harvesting. It is a beautiful process of timing and listening. I am researching and writing about this process too, and I appreciate what you have shared with us. Thank you for the kind comment. 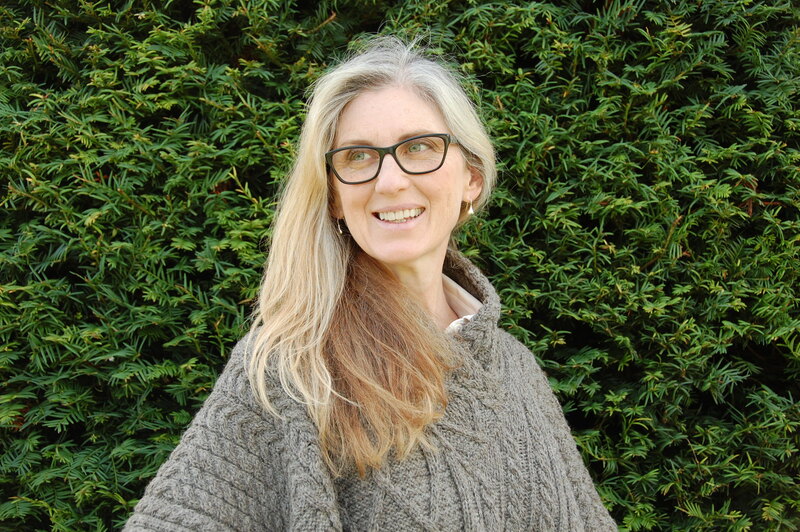 Are you researching for more poetry? I visited your site and read the beginning of your poem (will read the rest of course) but was very struck by the imagery of the cow delivering its calf. I had an identical experience as a child. It was very impacting.